1. Board bases with aluminum plates can stand high frequency and eliminate static interference. 2. 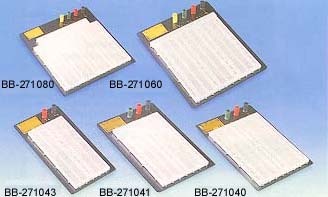 Breadboards are made from high quality ABS plastics. 3. Phosphor bronze/ nickel silver spring contact can be operated for more than 10,000 times. ** BB-271043J = BB-271043 + 140 pcs of jumper wires.